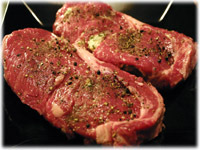 There's not a whole lot new lately when you're searching for different types of Rib Eye steak recipes, maybe a twist on a steak marinade or a different type of steak dry rub. 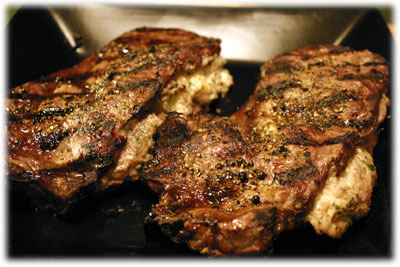 That's why I'm so excited to offer this very new and very unique crab stuffed rib steak recipe. To be honest it wasn't really amazing planning on my part, I was actually looking at different crab meat appetizers when I wondered what it would taste like inside a grilled rib eye. As far as unique recipes go this one's pretty easy to put together, about 5 minutes to prepare and then another 8 or 10 minutes to cook. This is almost like our Steak Oscar recipe - except all the goodies are tucked safely inside the steak instead of served on top. It's really like Surf & Turf all in one neat package. 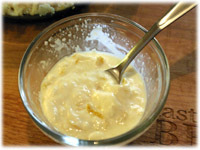 In a small bowl make the lemon mayonnaise by combining 3 tablespoons of mayonnaise with the juice and zest of 1/2 a lemon. 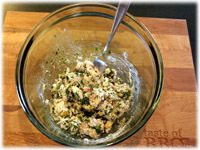 In a medium glass bowl combine the crab meat, breadcrumbs, salt, pepper and cilantro. Stir in the lemon mayonnaise and mix well so the crab stuffing ingredients are well combined. 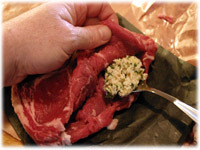 Lay the rib eye steaks flat on a cutting board and very carefully slice a pocket in the center of each rib eye with a sharp knife. 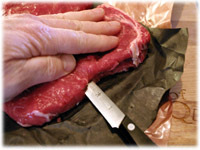 You don't want the knife to cut all the way through to the other side or through the top or bottom of the steak. If it does, it's not the end of the world - the stuffing is thick enough most of it will stay inside the steak while grilling. Spoon 1/2 the stuffing into one of the steaks and 1/2 into the other steak. I don't usually fasten the opening in the steak closed but if you want to just thread a toothpick through the steak to close it. Rub each side of the rib eye steaks with a very small amount of olive oil and then rub the crushed peppercorns over each side. Preheat your grill for 550F direct heat. When the grill's reached temperature place the rib eye very carefully (so the innards don't come out) on the hot grates and close the lid. 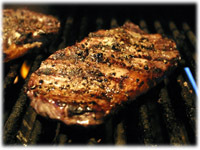 After 4 - 5 minutes very carefully flip the rib eye steaks over using a spatula. Do this carefully so the stuffing doesn't come out. Close the lid and cook another 4 - 5 minutes for medium-rare. 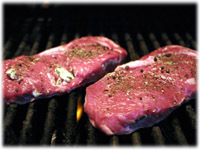 When cooked, remove the steaks to a serving platter, cover and let rest 5 minutes before serving. Serve with our garlic infused baked potato recipe and this tender prosciutto wrapped grilled asparagus recipe. Drizzle with a creamy Bearnaise sauce if you're so inclined!